Cathay Pacific Airways has become the second airline to operate the A350-1000, the world’s newest long range widebody airliner. The airline took delivery of the aircraft at a special event in Toulouse, France. Both aircraft are complementary and provide for maximum commonality with improved operating efficiencies. With its true long-range capability, the A350-1000 will form an important part of Cathay Pacific long-haul operations. 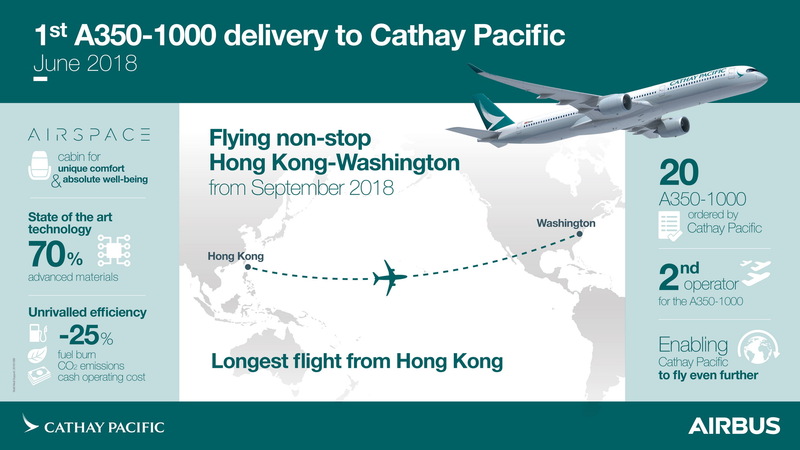 The aircraft will be deployed on the airline’s new non-stop route from Hong-Kong to Washington DC, representing the longest flight - approximately 17 hours - performed by any airline out of Hong Kong. Paul Loo, Cathay Pacific chief customer and commercial officer, said: “We already have one of the youngest long-haul fleets in the sky, and with the arrival of the A350-1000, our fleet is only going to get younger. “The aircraft follows the successful entry of the A350-900 variant which has enabled us to expand our long-haul network at a near unprecedented rate. The A350-1000 is the latest member of Airbus’ leading widebody family, showing high level of commonality with the A350-900 with 95 per cent common systems part numbers. As well as having a longer fuselage to accommodate 40 per cent larger premium area (compared to the A350-900), the A350-1000 also features a modified wing trailing-edge, new six-wheel main landing gears and more powerful Rolls-Royce Trent XWB-97 engines. To date 11 customers from five continents have ordered a total of 168 A350-1000s. Eric Schulz, Airbus chief commercial officer, said: “We are proud to deliver the A350-1000 to our long-standing customer Cathay Pacific. “Bringing major advantages in fuel and cost efficiency along with unrivalled passenger comfort, the A350-1000 is the perfect platform for Cathay Pacific to increase capacity on some of its longest routes.